With the season of wild garlic halfway through, I thought, I can’t let spring go by without at least one dish with this lovely wild herb. Wild garlic is a relative of our domestic chiv es with wider leaves and white flowers (which are edible) and the season goes from the beginning of April to June, depending on the weather. The leaves look very similar to the Lily of the Valley while the flowers are completely different (the leaves are the reason why people confuse these two plants and risk poisoning – if in doubt, leave the plant behind). Its preferred habitat are moist woodlands and can be found near coastal woodlands. All parts of the plant are edible but most people will use only the leaves (leaving the bulb behind will encourage new growth). The leaves can be steamed, cooked, made into soups or act as a replacement for basil in pesto. With all that in mind, I looked in the fridge the other day and thought of something to cook for Mr T. I love using up things I have already in the pantry or fridge and I remembered that I had bought pork mince two days earlier. So the idea of meatballs was born (there is loads of other things I could have made with the mince but I didn’t want to spend too much time in preparations as I was expecting Mr T back home soon). With the meatballs simmering away in the frying pan, I paid more attention to the wild garlic I bought at the Coal Quay Market (Caroline’s organically grown vegetables). The recipe below is just for the sauce and the meatballs. 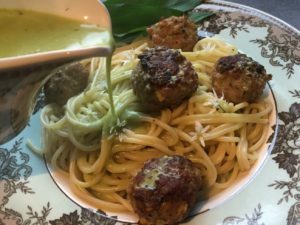 I served the meatballs in the sauce on a bed of spaghetti but it would also go perfectly with a smooth mash or even a risotto. Mr T loved the dish and asked for seconds. I found that the dish benefited from the addition of garlic to give the dish a bit of an extra oomph but you can leave it out if you prefer a more subtle flavour. In a bowl mix together the pork mince, onion, parsley, breadcrumbs and egg and mix with your hands until smooth. Divide into meatballs (don’t make them too big – slightly bigger than a walnut is perfect for this dish). In a frying pan, heat the oil and batch cook the meatballs until down, moving them around in the pan from time to time to allow browning from all sides (you want them cooked through but not too dark browned). Set aside and keep warm. For the sauce, in a saucepan, heat a bit of oil and fry the onions on a low heat for 3 minutes (you want them translucent but not browned). Add the garlic and cook for a further two minutes. Add the stock and the wine and bring to a boil. Simmer until the liquid has reduced by half. Add the cream, stir and take off the heat. Add the wild garlic, stir and leave to infuse for about 5 minutes. When cooled slightly, pour the liquid into a food processor and process until well combined and the leaves are only speckles. Return to the heat and bring to a simmer. Season to taste. Pass the sauce through a sieve, arrange the pork meatballs on a bed of pasta, mashed potatoes or rice and pour the sauce over. Garnish with the wild garlic flowers and serve.